UCLAN JB Firth Building - Ringtail Emergency Lighting. Ringtail Lighting has been selected to supply the emergency lighting system for the recent development of the JB Firth Building at the University of Central Lancashire, Preston. With a commercial relationship spanning over 10 years, Ringtail developed the specially designed units for UCLan along with design consultants BES Design (Preston) Ltd who demanded contemporary aesthetics coupled with a high performance LED lighting solution. Named after James Brierley Firth, one of the UK’s greatest pioneers of forensic science, the new building provides additional accommodation for the School of Forensic & Investigative Sciences and the School of Pharmacy & Biomedical Sciences. The new teaching space will accommodate up to 160 students and includes four laboratories, two rooms for chemistry teaching, one analytical laboratory and one fire laboratory. 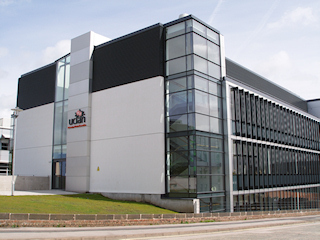 The new facility provides further evidence of UCLan’s impressive sustainability credentials; these include the largest solar panel array of any UK University and being one of the first 12 organisations nationally to achieve the Carbon Trust Standard. Ringtail Lighting, who are national suppliers of emergency lighting were appointed to supply the luminaires for the project by Chris Birrell, Director and Electrical Design Consultant at BES Design (Preston) Ltd, who specialise in the design and procurement of building and environmental services. Chris said: “We chose Ringtail for their vast expertise in lighting fabrication and specification. They have supplied us in the past with emergency illumination for a variety of national projects and have always delivered highly specified economical solutions, coupled with ongoing technical and contract support”. Ringtail supplied a range of LED self-test products including a bespoke multi-directional LED emergency luminaire developed for the JB Firth building stairways and escape routes. Ringtail Lighting’s Technical Sales Manager, Anthony Barrow added: “UCLan stipulated a policy whereby the emergency lighting system must be self testing and independent from the standard mains ambient lighting. Working with Chris at BES Design (Preston) Ltd we have supplied a discrete range of high powered LED emergency lighting. These luminaires all incorporate “Self-Test” technology, which constantly monitors the luminarie to ensure its correct operation”. Ringtail Lighting are the Northwest’s premier emergency lighting specialists, with full design and fabrication facilities, offering high quality professional service to clients, while offering the best advice and strategy on all emergency lighting requirements. We are a leading UK manufacturer, designer, and supplier of professional LED emergency and amenity lighting equipment.